Different software tools have been developed that support computer-aided process engineering. Nowadays, process models describing coupled systems on a very detailed level of accuracy become more and more complex. They cover not only lumped process systems in thermodynamic equilibrium but also distributed parameter systems governed by kinetic reaction and transport processes. Thus, process modeling projects depend increasingly on the efficient interdisciplinary collaboration in research. The need to develop and to solve customized models has found a great response and there exists a variety of mathematical software modeling tools that support the programming of equation based models. Moreover, existing standards provide a general framework for the integration and combination of software modeling components such as units, solvers and physical properties packages from different sources. 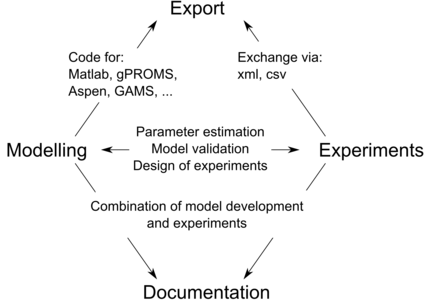 However, the work flow analysis of model development and implementation still reveals major challenges such as reduction of modeling errors and programming effort, documentation-level modeling, code generation from symbolic expressions, reuse of ready-made and implemented models, as well as support of the multidisciplinary cooperation of research groups. The main goal is the development of a new systematic modeling approach to the dynamic plant-wide simulation of highly integrated processes. Thus, in this project the two proposed process concepts for the hydroformylation of long chained olefins based on innovative solvents will also be simulated and validated in the constructed mini-plants. For this purpose, a new modeling and simulation environment is developed for the hierarchical modeling of integrated processes, which combines concepts such as equation-based modeling, use of symbolic mathematic language, and code generation. The proposed tool follows a new modeling approach for the re-use of single equations and the support of different naming conventions. The modeling is done strictly in the documentation level. Furthermore, starting from the collection of a number of partial models, the best model combination is determined iteratively. For this purpose, the modeling procedure is linked through the use of experimental data in order to generate plant-wide models. The solution strategy is performed by applying approaches to optimal synthesis model, model discrimination and using a structured model and measurement databank. Model and data library: Mathematical models and experimental data are now centrally stored in a central MySQL-Database, thus providing the functionality of an integrated platform for model and data management. In addition to a large number of basic equation based models (e.g. mixer, flash stages) which build the standard model library, most major models developed within the first funding period of InPROMPT are available in the data base. Due to the central character of the database users have the option to share their work with other MOSAIC users and can also implement already existing equation systems in their models. As an example, the reaction kinetics developed in project A3 were implemented in MOSAIC and made available to the other projects in different reactor models. The heterosegmented PCP-SAFT EOS model has also been implemented in an equation oriented way. The availability of experimental data, which was realized through expansion of the model database enable an efficient realization of of model based tasks. Analysis of equation systems in MOSAIC: When a model is implemented, it can be useful to check the structure of the equation system. It is now possible for the user to analyze the final equation systems. Algorithms have been implemented which reorder the equations. For example the Dumage Mendelssohn Decomposition, which can be applied on the sparsity pattern of the Jacobian. The user can directly see if the equation system is well defined. Problematic areas, which are missing an equation or variable, or are useless at all, are highlighted. Everything is presented in an interactive environment where the modeler is able to investigate the connections and possible improvements. modeling and optimization. With MOSAIC it is now possible to make use of all major types of derivates. The user has to choose if he wants to use symbolic, numerical or automatic differentiation. The code for the numerical derivatives can be directly implemented and the symbolic derivatives are calculated from MOSAIC by analyzing the MathML files and applying the chain rule on the equations. For automatic differentiation, it is possible to implement the preferred library as for example ADOL-C, ADiMat or CppAD.